The fact that BetOnline Poker comes from an online stable that has been providing reliable online gaming action since 1998 will make this a site that players will trust. The poker element may only have been set up in 2010 but the experience of providing a safe and secure online gaming environment has been in place for a considerable period of time. As the site has developed from the sports betting and casino background, it is a poker site that has a lot of inexperienced and novice players. This means that BetOnline Poker is a brilliant site to play on if you are looking to develop your confidence or if you are looking to make some money by defeating poker players that are developing their skills. While BetOnline manage to provide welcome, reload and slot bonuses for their sports betting and casino options, at the time of checking, there was no welcome bonus offer for poker players. This has not always been the case with the site previously offering a 25% matched deposit poker bonus for new deposits. 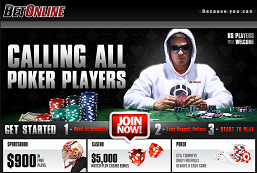 Click here to join BetOnline Poker – You will receive 25% cash bonus on all deposits! With the level of competition in the online poker industry, this is obviously a disappointment but it may well be that the matched poker deposit will resurface again soon. It would be advisable to check back to the site on a regular basis to ensure that you do not miss out on any promotions of this nature. It would be fair to say that there is a notable lack of promotions for poker players but with the poker section of the BetOnline site being a relatively new addition, the site is still finding its feet. It does have a number of other benefits to boast about though and if you are looking for one online site that can provide you with everything you need in online gaming, this site could well be the option you are looking for. There is $150,000 on offer in guaranteed tournaments every month on the site and the POP Points grant you entry to tournaments that can give you a lot more chances to be a cash winner. The fact that there is a lot of money to be won from playing on the site will be pleasing to a lot of online poker players but in comparison to other online poker sites, BetOnline Poker does lag slightly behind the full range of poker options. If you are looking for an online poker site that provides plenty of freerolls, you will struggle to find a better option than the BetOnline Poker site. There are freerolls every day, in fact, there are quite a lot of freerolls every day so no matter when you get the chance to sign on to the site, you should have the opportunity to enjoy some great poker games for free. Mac users are also well catered for with a Mac platform that is as every bit reliable as the Windows platform. This is not something that happens too often so if you are a Mac user, you should be giving BetOnline Poker some serious consideration. Unfortunately there is no rakeback option available on the site, which is disappointing compared to other online poker sites. Again, this may be an element that is added to the site when it develops but at the moment, this is definitely something that is lacking. One of the slight drawbacks of the BetOnline poker site is the limited number of poker games available. You will only find Texas Hold ‘Em, Omaha and Omaha Hi/Lo games, which are certainly the most popular online poker games but a greater level of variety would be of benefit to most players. The gameplay is very smooth and there are no issues with the software for the BetOnline Poker games at all. You will find you can choose between two types of table layouts and the site is very user friendly. Some critics may argue that the minimalistic nature of the online poker site helps to keep everything simple but even the most casual of online poker players should be able to get used to this site very quickly. There are plenty of cash games available on the site though, in fact, BetOnline Poker is rather proud of the fact that there are cash games available around the clock. With BetOnline Poker allowing US based poker players to play; there is a word-wide audience for the site, which is great for poker players who like to play at non-peak times. The software on the site is provided by Playsafe Holdings and in an average day, there are around 500 poker players on at busiest times. This means that BetOnline Poker is far from the busiest of online poker sites but there is a good mix of players on the site. This means that you should always be able to enjoy cash games, sit n go games and even some great tournaments on a regular basis. The sports betting, horse racing and casino gaming options are the cornerstone of what the site provides to players and it would be fair to say that most users came across the site by these elements. The sports betting options provide a wide range of sports to bet on with the standard range of US sports bets. There are also a number of live in-play betting opportunities with golf, NHL, NBA and NFL all well represented during their respected seasons. The sports betting opportunities provided by the site rank highly amongst all of the options available for US players and you should find that this is one of the biggest reasons to sign up for the site. If you are looking to make sports bets from your mobile phone or tablet device, BetOnline is able to provide everything that you could ever need. Given the way that people access the internet is changing thanks to the developing technology surrounding mobile devices and BetOnline is at the forefront of mobile sports betting.